Plasmodium falciparum antigenic diversity and polymorphism confuses the issue of antimalarial vaccine development. Merozoite surface protein (MSP)-1 and -2 are two highly polymorphic vaccine candidates. Characterisation of their precise polymorphism in endemic regions may facilitate the design of an effective vaccine. Isolates obtained in 52 Gabonese children presenting with uncomplicated malaria were genotyped by nested-PCR of msp-1 block 2, and msp-2 block 3, to analyze both parasite population polymorphism and clone fluctuations. Twenty-five and 19 different alleles were respectively obtained for msp-1 and msp-2 loci, the RO33 family of msp-1 being poorly polymorphic. Four cases of non-random distribution of alleles were reported of the FC27, and/or 3D7 families of msp-2. All but two isolates were composed of more than one genotype, and the multiplicity of infection (MOI) was 4.0. Neither parasite density nor age was related to MOI. Clone fluctuations were studied for ten subjects who were sampled again at reappearance of parasites in blood. Disappearance and reappearance of alleles were observed following treatment, suggesting difficulties in assessing polymorphism and in distinguishing reinfection from recrudescence. P. falciparum polymorphism is extensive in Southeast Gabon, and most of infections are composed of multiple clones. The fluctuation of clones contributes to parasite diversity. One main limitation to the development of a vaccine against Plasmodium falciparum is the antigenic diversity related to P. falciparum polymorphism. Merozoite surface protein (MSP)-1 and MSP-2 are two proteins causing immune response in humans [1–4] and are prime vaccine candidates. Perhaps as part of an immune evasion mechanism, msp-119 and msp-2 DNA sequences include variable blocks generating antigenically diverse forms [4, 5]. The polymorphism at these two loci is mainly assessed by the number of repeats [6–8], which can be used to distinguish by size the different alleles after PCR amplification. The phenomenon of clone fluctuation, which consists of kinetic changes in the relative load of each parasite sub-population present in blood [9, 10], is important to consider when studying P. falciparum diversity. Strain-specific immunity is largely responsible for protective immunity to malaria parasites [11, 12]. In malaria endemic areas, infections due to multiple parasite clones are frequent [11, 13–16], and clone fluctuation may be a logical strategy to slow down the appearance of strain-specific responses. However, mechanisms other than immune evasion may be involved in peripheral blood genotypes' fluctuations, including sequestration in the deep vasculature, strain competition, and clearance effect related to either strain-specific immune response or treatment. Allelic diversity and clone fluctuation have rarely been assessed in the same study, although their concomitant existence highly complicates the analysis of P. falciparum polymorphism. We studied both mechanisms in P. falciparum-infected children from Gabon and discuss the implications of our findings. Bakoumba, a village from southeast Gabon in the Haut-Ogooué province, belongs to a meso- to hyper-endemic area for P. falciparum malaria . The average EIR for February and March 2000, the time of the study, was 0.83 infective bite per man per night, due to Anopheles gambiae, Anopheles funestus, and Anopheles moucheti (Elissa et al., personal communication). Samples were collected during a treatment efficacy study of sulfadoxine-pyrimethamine combination and amodiaquine carried out between January and June 2000 . This study involved 252 subjects aged between six months and 10 years. Patients were followed weekly during four weeks after treatment (Day 0), as well as any other day if the child was unwell. At enrolment, and during the follow-up, finger-prick blood was sampled for thick smears and collection on filter paper. Patients involved in the present study were the 52 children in which treatment failed, and for which multiple parasitised blood samples were available. Ethical clearance was given by the Ethics Committee of the International Centre for Medical Research of Franceville, and informed consent was obtained from parents or guardians. Blood collected on filter-paper was dried and conserved at room temperature until extraction. DNA was prepared by chelex extraction, as described , and stored at -20° C. The oligonucleotides primers were designed from published sequences, as listed in the Nucleotide Blast Database, to amplify block 2 of msp-1 , and block 3 of msp-2 . The two genes were amplified by nested PCR, each amplification with conserved, or family-specific primer pair, being done separately, as described . PCR products were electrophoresed on 1.5% agarose gels, and DNA visualized by ultraviolet transillumination after ethidium bromide staining. Fragments obtained were compared by size. For comparison, purified genomic DNA from W2, HB3 and 3D7 laboratory strains were amplified and electrophoresed similarly. All migrations were repeated at least twice. The multiplicity of infection (MOI), or number of genotypes per infection, was calculated as the highest number of genotypes at any of the two MSP loci. Relations between the MOI and age or parasite density were studied using the Spearman correlation test. The prevalence of each family was calculated as the percentage of D0 samples containing allele(s) of this family. The distribution of the specific families was estimated at each of the two loci as the percentage of fragments assigned to one family within the overall number of fragments. The occurrence of specific associations of paired alleles was analysed by the Fisher's exact test. Fifty-two samples collected at enrolment were used for describing parasite allelic diversity. Additional samples were collected from the same subjects, at first reappearance of parasites in blood, 7 to 21 days following treatment. In 10 subjects, a third sample was obtained 5 to 14 days later. Finally, a fourth sample was available from one subject. All genotyped samples were positive for msp-1 and msp-2 PCR. Among the 52 D0 samples, at the msp-1 locus, 14 alleles of the K1 family ranged from 135 to 330 bp; 8 MAD20 alleles ranged from 190 to 280 bp; and 3 of the RO33 family were of 160, 230, and 250 bp (table 2). For the msp-2 locus, 11 FC27 alleles ranged from 300 to 600 bp; and 8 3D7 alleles ranged from 360 to 590 bp. Forty-seven (90.4%) D0 samples harboured K1 parasites, 33 (63.5%) MAD20 parasites, and 19 (36.5%) RO33 parasites. For msp-2, 34 (65.4%) isolates contained FC27 parasites, and 43 (82.7%) 3D7 parasites. At each locus, family distribution was 52.5%, 32.5%, and 15.0% for K1, MAD20, and RO33 of msp-1; and 49.7% and 50.3% for FC27 and 3D7 of msp-2. Four specific associations of two alleles were over-represented. In the FC27 family, the 500 and 560 bp (P = 0.004), and the 530 and 600 bp alleles (P < 0.0001) were positively associated. In the 3D7 family, the 500 bp allele was associated positively to the 560 bp allele (P = 0.01) and negatively to the 530 bp allele (P = 0.01). 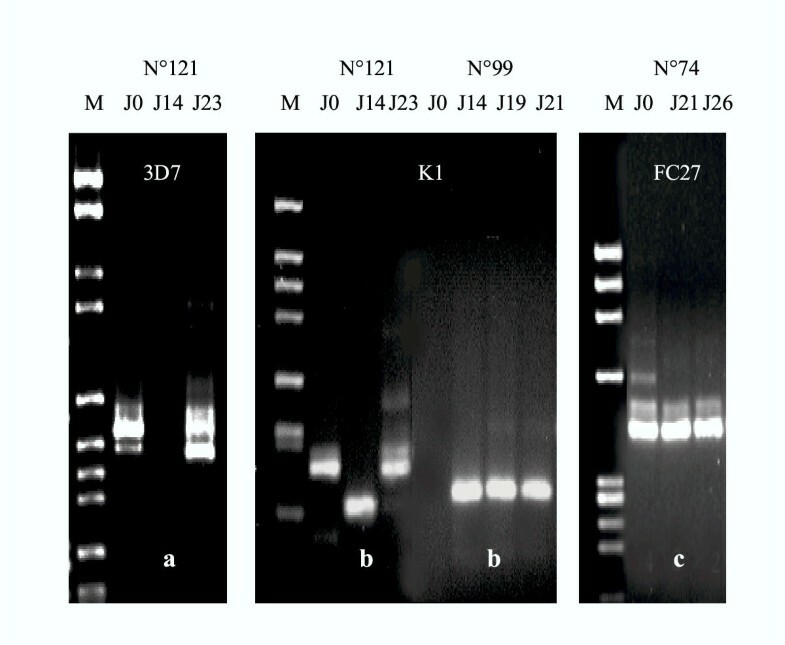 Sequences of oligonucleotide primers used to amplify merozoite surface protein (msp)-1 and msp-2 polymorphic regions of Plasmodium falciparum isolates from Gabon. Merozoite surface protein (msp)-1 and msp-2 polymorphism in isolates from 52 Gabonese children presenting with a Plasmodium falciparum malaria attack, 2000. Before treatment, MOI (± SE) was 4.0 (± 0.26). All but two samples contained at least two distinct parasite lines. The two single clonal infections were composed by parasites belonging to the K1 family of msp-1, and to the FC27 and 3D7 family of msp-2, respectively. MOI was not correlated to age (Figure 1, Spearman correlation, P > 0.1), although the number of genotypes of the K1 family increased with age (Spearman correlation, P = 0.04). Mean number of genotypes in merozoite surface protein (msp)-1 and -2 polymorphic families of Plasmodium falciparum collected in the blood of 52 children, 0 to 95 months old, presenting with a malaria attack in Gabon, by age. Following treatment, parasites reappeared in the blood of 10 children in which 2 or 3 additional blood samples were obtained. Three types of fluctuating figures of msp-1 and msp-2 molecular patterns were obtained (Figure 2). In type a, one or several initial allele(s) transiently vanished and recurred thereafter. In type b, new alleles appeared at intermediate and/or final points, although some initial alleles may persist. In type c, alleles observed at intermediate and final points were all present at D0. Variations in parasite densities were not related to appearance or disappearance of alleles (Spearman test for MOI and parasite density, P > 0.1). The disappearance of alleles, as in type c, could be attributed to treatment efficacy, and cannot be considered as parasite fluctuation. Recurrent parasites with identical genotype as initial parasites are likely drug-resistant parasites. Among the 5 families of msp-1 and msp-2 genes, a or b fluctuating types were observed in 9 of the 10 children. The figure of the child n° 170 was of type c for all 5 families. Examples of clonal fluctuations in successive blood samples between Day 0 and Day 28. The different clonal fluctuation figures were classified by type a, b, or c. Type a: one or several of the initial allele(s) transiently vanished, and were present again at the final point. Type b: new alleles appeared at intermediate and/or final points, although some of the initial alleles may be still present. Type c: alleles observed at intermediate and final points were all present at D0. This work investigated the polymorphism of P. falciparum subpopulations in Gabon, by nested-PCR typing. This method does not allow one to distinguish alleles of identical size, but differing in sequences . Competition between alleles during PCR amplification has previously been described . Identical field samples were genotyped in different laboratories , and the main difference lied in the number of alleles detected. Our parasite isolates, as most field samples, contained several clones with polymorphic msp-1 and msp-2 sequences at the variable blocks that may differ considerably in size, nucleotide sequence, and repeat copy number [7, 23]. In such conditions, nested-PCR remains a suitable method to study msp polymorphism. Nevertheless, the results should be considered with the method limitations in mind, as variations in sensitivity were seen throughout experiments for weak bands, as well as in the estimation of band's length. When the same samples were electrophoresed several times, faint bands were inconsistently visible, demonstrating variations in technique sensitivity, due to unmanageable changes in temperature or moisture content. Estimation of band's length was liable to disparities between and within gels. Given these limitations, it is important to replicate all PCR products migrations. This study showed high allelic diversity, as 25 and 19 different alleles were respectively present at the msp-1 and msp-2 loci. However, the RO33 family of msp-1 was poorly polymorphic, with only 3 different alleles detected. At the msp-2 locus, FC27 and 3D7 alleles were nearly equally distributed, whereas alleles belonging to the K1 family were more frequent at the msp-1 locus. This situation differs from that of Dienga , a village from the same area of Gabon (both villages being 45 km apart), where the R033 family was the most frequent at the msp-1 locus in isolates from asymptomatic subjects. However, a single RO33 allele was detected, confirming the reduced polymorphism of this family. 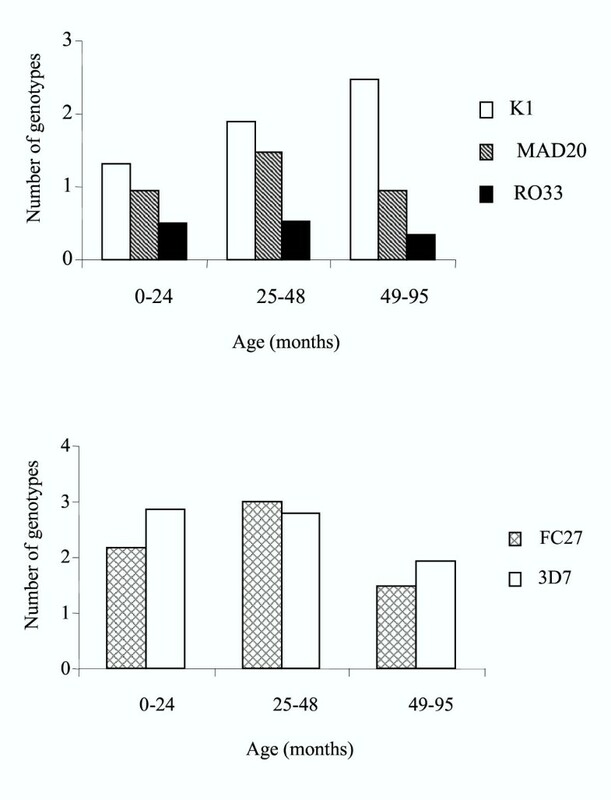 In a more recent study in Dienga , RO33 and FC27 alleles were mainly found during asymptomatic infections, whereas K1, MAD20, and 3D7 were predominant in isolates from clinical infections. Such a differential distribution according to clinical status was not observed in Cameroonian , Senegalese , nor Kenyan  isolates. In Senegal  and Thailand , the RO33 family was poorly polymorphic, as opposed to the other MSP-1 and MSP-2 families. The msp-2 locus is usually highly polymorphic, and FC27 and 3D7 families are both highly represented [14, 26, 27]. Multiple bands were observed in all but two samples, and the MOI was 4.0, probably as a consequence of the high transmission level [14, 27]. The very high MOI may also be explained by the clinical and immunological status of the patients, although conflicting results are present in the literature. Some studies indicated that MOI decreases with age in asymptomatic subjects after 15 years [28, 29]. In our study, age was not related to the number of genotypes, in agreement with several studies achieved with symptomatic or asymptomatic subjects [14–16]. Ten subjects were studied at multiple points during four weeks. In nine, alleles fluctuated with time. Either alleles transiently disappeared, or additional alleles appeared (and eventually disappeared) during the follow up. We cannot rule out that clonal disappearance was the result of treatment activity, and its reappearance due to reinfection by a new anopheles bite. However, parasite population showed a very rich polymorphism of msp-1 and msp-2 loci composed of at least 22 different alleles, with the most common allele not exceeding 28% of all alleles of a given family. The concomitant reinfection by several clones similar to those present in the initial infection would be very unlikely. Alleles fluctuations were more likely related to variations of the alleles ratios in peripheral blood, as reported over a several months period in the absence of malaria transmission . In holoendemic areas, Daubersies et al. concluded that a rapid turnover of parasite populations inoculated by mosquitoes has occurred, whereas Farnert et al. suggested fluctuations of inherently synchronous subpopulations. Several mechanisms may be involved including sequestration in the deep vasculature, strain competition, strain-specific immune response, and/or parasite immune evasion. In our study, treatment efficacy is also responsible for the disappearance of sensitive clones, and drug-resistance is liable for recrudescent parasites. The appearance of new allele(s) could be attributed to reinfection by new clone(s), or to detection of genotype(s) present earlier at undetectable concentration. Clonal fluctuation causes huge difficulties in determining the precise composition of a parasite population. PCR distinction between recrudescent and newly inoculated parasites is critical in treatment efficacy studies. Only recrudescent clones can be warranted, while reinfections cannot be ascertained. Although the method had showed limitations, this study illustrated high polymorphism in Southeast Gabon with respectively 25 and 19 different alleles at msp-1 and msp-2 loci. Infections were highly complex, malaria attacks being characterized by a mean of four genotypes per infection. Clonal fluctuation increases infection complexity and makes polymorphism analysis difficult. These results illustrate two forms of P. falciparum complexity in a high transmission area: sequence polymorphism and clonal fluctuation. We are grateful to the children who participated in the study, as well as to their mothers and guardians. We thank Dr M. Bakary and J. Mayombo for help in patient management, and J. Bourgeais, SODEPAL, for logistical support in Bakoumba. We are also grateful to Jacques Le Bras and Remy Durand for helpful discussions, and Odile Mercereau Puijalon for critical reading of the manuscript. This work was supported by the French Ministry of Research (VIHPAL grant) and by the Fondation pour la Recherche Médicale. Agnès Aubouy was the recipient of a fellowship from the French Ministry of Research. Field work was done at Bakoumba Hospital, Gabon. Laboratory work was conducted at CIRMF, Gabon. Agnès Aubouy carried out the laboratory work. The three authors participated in the design of the study, the analysis and the interpretation of the results, as well as in preparing the manuscript.